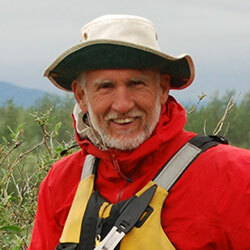 Stu Osthoff has been the Publisher/editor of The Boundary Waters Journal for the past 32 years and operates Grand Slam Guide Service. He has led over 200 week-long canoe trips into the BWCAW/Quetico and is passionate about doing whatever it takes to get his clients into trophy canoe country fishing. The Boundary Waters has been his life and livelihood. Nobody knows more about how/when/where to make the absolute most of your canoe trip. Stu has presented many times at Canoecopia and this is yet another way to share what he knows and loves about canoe country. Join Stu Osthoff, Boundary Water Journal publisher and wilderness guide, and Rob Kesselring, outdoor writer and wilderness guide, compare and contrast the traditional style of wilderness canoe tripping to the ultralight approach. Two lifetimes of hard-core wilderness paddling, all distilled down to the essence of why we go, plus a boatload of advice on how, when, and where to make your own wilderness canoe tripping goals happen. Come learn some new ideas in this fun debate, back by popular demand.